A pair of teens conduct an experiment to attempt to convince their old, reclusive neighbor that his house is haunted, all while documenting the whole experiment on video. "The Good Neighbor" is the feature film debut for director Kasra Farahani, as well as writers Mark Bianculli and Jeff Richard. The thriller stars Logan Miller and Keir Gillchrist as Ethan and Sean, a pair of teens who are conducting a 6 week long scientific experiment to try and convince their neighbor his house is haunted. They do this by rigging their neighbor's house with gadgets that cause strange things to occur. They mount multiple hidden cameras to document it all on video with the ability to tune in anytime they want remotely from Ethan's house across the street. Joining them is James Caan, who plays the aforementioned neighbor Harold Grainey. He is a bit of a recluse and is not very friendly. He would rather keep to himself and doesn't like anyone else in his business. While the two study him, they find that he doesn't react how they expected he would. As their paranoia sets in, they wonder what he is hiding in areas where they don't have surveillance, like his padlocked basement. The movie runs through three different time periods that are woven together. The main time period involves the experiment itself, the second involves a trial surrounding an incident that takes place during their experiment, and the third features flashbacks of Harold Grainey's life. These flashbacks occur because of the present events of the teens' experiment, causing trigger memories for Harold. Director Farahani slowly doles out information as the story unfolds. Most of the primary storyline is shot found-footage style through the use of surveillance equipment and hand-held cameras, while the rest is all shot like a standard movie. The reason for this is that the found-footage stuff is being shown as evidence at the aforementioned trial, which is sort of a unique take on the found-footage genre. James Caan offers a solid performance and shows he can still be very intimidating, even as an older actor. We start to wonder at some point what he's really hiding, or if he's being played like the rest of us, a cruel byproduct of Ethan and Sean's experiment gone terribly wrong. Speaking of Ethan and Sean, Logan Miller and Kier Gillchrist do decent jobs playing jaded teenagers looking to poke a potentially sleeping bear. At first, Sean is apprehensive to take part in the experiment, but when prodded by Ethan to play along, he agrees to take part. 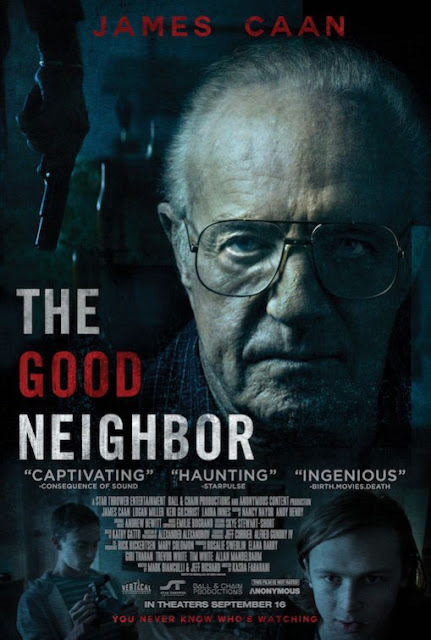 "The Good Neighbor" is very reminiscent of movies like "Rear Window" and "Disturbia," which deal with voyeurism, paranoia, and perception. Though this film is certainly flawed and won't rewrite history when it comes to crime dramas, it still manages to be a mostly engaging thriller with a few intense and stunning moments.